Holiday Staycation w/ Make it Makati & Mastercard! Make It Makati x Mastercard 2015 promo launch last October 23! “For 3 years, Make It Makati and MasterCard, together with the country’s finest hotel brands – Raffles and Fairmont Makati, InterContinental Manila and Holiday Inn & Suites Makati, have been giving the public compelling reasons to stay in Makati” says Manny Blas, Ayala Land Vice President and Project Development Head of Makati. * 50% discount on Best Available room rates on weekends, Friday to Sunday (except for the following black-out dates: November 13-19, and Dec. 31). *,Willow Stream Spa 50% off promo on weekdays - Monday to Thursday, 10am to 3pm, on all ala carte massage treatments. * 50% off on Best Flexible room rates on weekends! * 50% off at Café Jeepney and Flavors. This is applicable to a minimum of two diners and a maximum of 10 for every visit. *For every three diners at Prince Albert, the fourth eats for free. Book your staycation at any of the hotels mentioned above and enjoy a Circuit Makati Bundle that includes 2 Circuit Bazaar Tickets, 2 Karl Edwards Bazaar Tickets, 2 Solar Mad Fest Tickets, and a food voucher for every Power Mac Center Spotlight ticket purchase. Our room at Holiday Inn! Hotel assignments was through draw lots and I'm so happy Ana got Holiday Inn & Suites! Was supposed to have a client meeting in Glorietta that evening and pullouts the next day, so I secretly prayed for that. Holiday Inn kasi is located beside Glorietta lang. Haha. Thank you, Lord! Had to resched my meeting though 'coz there was suddenly a jampacked Makati tour for all the participants and I have this FOMO. Hehe. thanks Ana for the room pics! My favorite area. Naks. Haha. Perfect for those who still need to work even on a holiday. present! Lakas maka CEO ng dating. Lol. super comfy bed! Ana and I each have our own side. Kay Tracy yung middle. Haha. When I got there, at around 3:45pm, Ana was eating room service na! You won't ever starve here. Also, best fries eveeer. YUM. Best place to catch up with your friends! always fun bonding with Ana! thanks Niche for our photo! My white top is from River Island, jumper is thrifted & brogues from SM Parisian! So cute our tour bus noh? 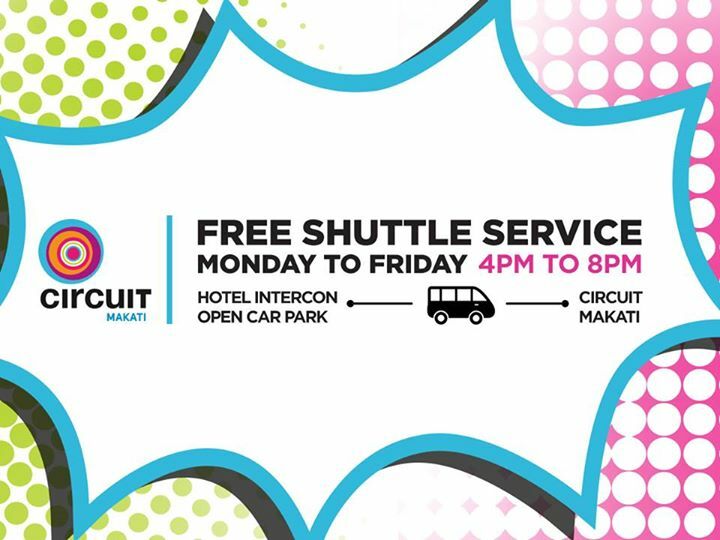 It's also a free shuttle service to Circuit Makati for everyone! Other press people and bloggers who are staying in Holiday Inn, Raffles and Fairmont. Our first stop was this Lifescapes by Alveo showroom! Love this detailed Circuit Makati diorama! Circuit Makati by Ayala Land, Makati's new lifestyle hub has everything for everyone-- shopping malls, hotels, residential and office skyscrapers, artificial football field (called Gatorade Chelsea FC Blue Pitch), Mountain Dew skate park, Power Mac Center Spotlight (where small concerts or performances are held), Go Kart race track, and Globe Circuit events ground. So much to do here! Second stop? City Kart Racing! I had a hard time controlling my kart (mostly due to my shoes slipping) so I wasn't able to drive properly. The helmet was also super loose it kept on blocking my face and my view. Haha! It was still so much fun! They emailed us our speed results! We were on a rush so we had to take out our food to make it on time for Sandbox Co's No Filter 2.0, a play about millenials, shown at the Power Mac Spotlight theater! My favorite scene is that of Cai Cortez's "Love Me Tinder". Super laughtrip! Another favorite would be the story about Icarus. How a dad and his son live and defines life. Loved Sam Concepcion's job interview and break-up segment! It was a long day so it was finally time to retire and enjoy our awesome room at Holiday Inn! Don't invite Tracy to dinner or lunch especially if you're super hungry. 50 years magpic! Haha! Tracy and I left a little over 2pm coz we watched Aldub Ang Tamang Panahon pa. Haha! We could stay there forever. But you know, sometimes, all good things should come to an end. Thank you so much Niche, Ayala, Make it Makati and Holiday Inn for giving us the break we deserve! Haha DDSS--deserve na deserve sa sarili. For serious, thank you. Makati is awesome.